We'll give your creativity a jump-start with these clever and surprising alternative uses for a walk-in closet. Yes, you read that right... bedroom. Turn the walk-in closet into a kid's sleeping area or a mini-guest room. Use a daybed for even more versatility with added seating space. Make those 2 a.m. feedings just a little bit easier. When you use the walk-in closet as a nursery, you won't even need to leave your room. There's plenty of space to include a changing station and supplies as well. Whether you work from home or just handle household duties, it's nice to have a dedicated office space but you might not want to take up an entire room. A walk-in closet is a perfect size for a desk, chair and file cabinet or two. Do the kids get easily distracted doing homework in the living room or at the dining table? They'll love having their own personal desk and a space to store books, backpacks and other school materials. Picking up toys and games from the living room floor can be a tedious, never-ending job. Give the kids free rein with a "private" playroom that's out of sight when guests are visiting. Without room to move, creativity can get stifled. Set up shop in the walk-in closet for sewing, needlework, crafts or your own favorite leisure time activity. Serious reading calls for a cozy corner where you can indulge without interruption. All you need is a comfy chair, reading lamp and small table for a cup of tea or snacks. If you like, add a small bookcase or shelving unit to hold your books. Do you love to entertain? 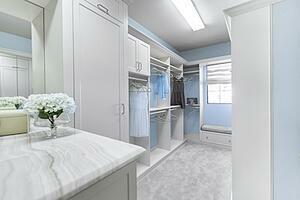 Open up your party space by converting your walk-in closet to a dry bar. It's a great way to keep people circulating instead of clogging up the kitchen. Have you come up with an inventive way to use a walk-in closet? Share it with us in the comments!